Manchester United are prepared to reward Marcus Rashford with a new long-term contract which will double his wages at the club. The England international has thrived in the striker's position under caretaker boss Ole Gunnar Solskjaer and he has netted in four of the club's previous six matches in all competitions. According to The Mirror, Rashford's form has encouraged the club to begin contract talks with the striker and they are prepared to double his current salary of £75,000-a-week. 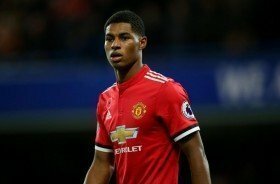 Rashford has previously been linked with a potential move to Real Madrid, though the striker has regularly cited his ambition of staying put with the Red Devils on a long-term basis. Aside from Rashford, the club are planning to reward goalkeeper David de Gea with a fresh bumper deal after another impressive season in the Premier League. The Spain international is widely expected to sign a fresh five-year contract with wages of around £400,000-a-week which would make him the club's second highest-earner behind Alexis Sanchez.